How do you get these &$#@! Christmas icicle lights to hang straight!? A little searching around the net provides some suggestions. Most people seem to think you shouldn’t worry about it because from the road no one will notice. I disagree. Of the people with suggestions, most just say to hang them when it’s warm out. This being late November in New England, the high today was 43 degrees. Some suggest hanging them inside with weights and using a hairdryer to warm them. One person talked about cutting acrylic into strips and using twist ties to connect each icicle to one strip. What caught my attention though was the guy who used small wire ties to connect each icicle to a large wire tie. That seemed like it would work, but in the end I used stem wires which are 18 gauge wires designed to hold flower stems straight. I found them at A. C. Moore. I started by putting a 180 degree bend in one end and crimping it to one of the horizontal wires. Then I wrapped the icicle around the stem wire. 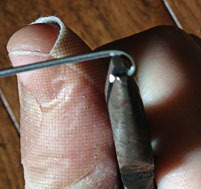 At the bottom I put another 180 degree bend, followed by a 90 degree bend and then closed it around the icicle wire again. It was a bit of a pain to do this for each icicle, but didn’t take that long and they hang nice and straight now. It looks so much nicer than the random curves and bends. The next trick will be figuring out a way to pack them that does not bend the wires into little random shapes. I’m thinking maybe wrap them around a board. The stem wires I used started out 18 inches long. When I trimmed them to fit the longest icicles the left over bit was long enough to do the medium length icicles. 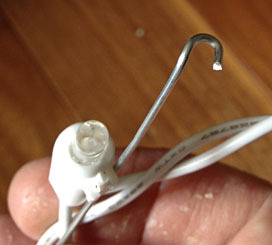 The shortest icicles were only two lights long and did not need stem wires. Each 24 foot long light strip had 18 of each length of icicle, so I only needed 18 stem wires per 24 feet. At A. C. Moore I found packages of 20 stem wires for about $2 each. I was able to do 120 feet with about $10 worth of stem wires. I talked my wife into taking a video of me adding a stem wire to one icicle so you could see how I did it. I figured my description above might not be sufficient. If you store your lights in a shed or unheated attic or anywhere else below room temperature, I recommend bringing your lights into the living area of your house a day before you hang them so they have time to warm up. They will be a lot easier to work with at room temperature because the insulation on the wires will be much more flexible.